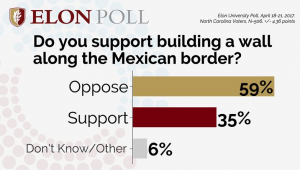 New Elon Poll results: Trump’s support declining in N.C. 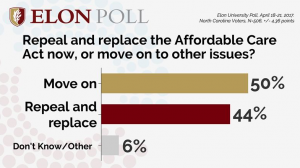 The new Elon University Poll is out today – and it shows declining support for President Donald Trump in North Carolina. “Though President Trump enjoyed considerable support among North Carolinians on Election Day, he has lost ground among the crucial independent voters responsible for his success over Hillary Clinton,” said Jason Husser, director of the Elon University Poll, in a press statement. Trump was elected in November with about 50 percent of the vote in North Carolina. The new poll shows his job approval down to 41.6 percent, with 50.5 percent disapproving. Recent national polls have the president’s job approval at around 42 percent – very low when compared to this period in the presidencies of the last few of his predecessors. 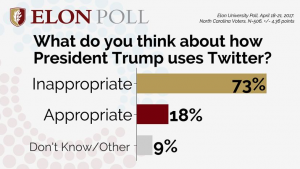 Results on Trump’s use of Twitter, whether it is time to move on from repeal of the Affordable Care Act and the building of a border wall with Mexico were also not good news for the president. Read the full report on the poll here.